Take a pot (we used a large saucepan) of water and bring it to a boil. Add the potato and carrot to the water, letting it cook for 6 to 8 minutes or until the potatoes are just fork-tender*. Drain the carrots and potatoes and add them to a high-powered blender right afterwards. Add all of the other ingredients to the blender and put the lid on afterwards, mixing on high speed just until smooth. If the cheese has cooled down too much, you can reheat this in a saucepan for a few minutes over low heat until it’s bubbling or just microwave the cheese (we chose to reheat this in a saucepan). If you think the cheese has lost its smooth consistency during reheating, try adding in a small amount of water or nondairy milk. *You don’t want to cook the potatoes too long or else they can get starchy and therefore prevent you from getting a nice smooth cheese. Yields around 1 ½ cups. 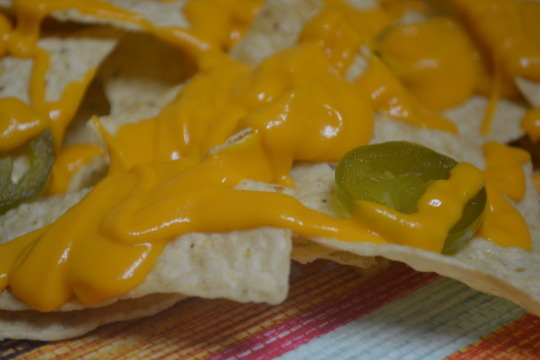 This recipe really makes you feel like you’re eating actual nacho cheese ! Having it on chips with extra pickled jalapeño slices took us right back to times spent going out to see a movie and munching on some nachos ! The cheese does have a bit of tanginess to it (thanks to the brine and lemon juice) but it doesn’t overwhelm the cheesy flavor. 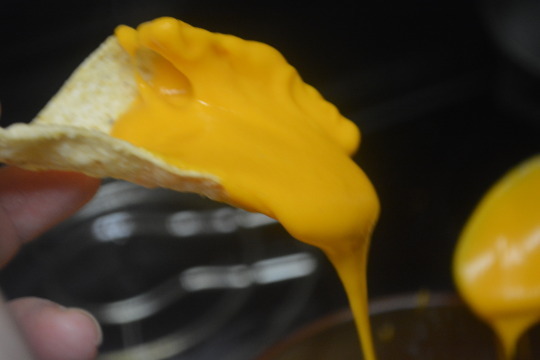 Between it’s creaminess and flavor, we’d love to try making a macaroni and cheese using this nacho cheese ! This recipe came from “Vegan Comfort Classics” by Lauren Toyota. We weren’t paid in any form to promote the cookbook or Lauren Toyota.